For centuries, cats have been regarded as symbols of cleverness and good fortune all across the globe. 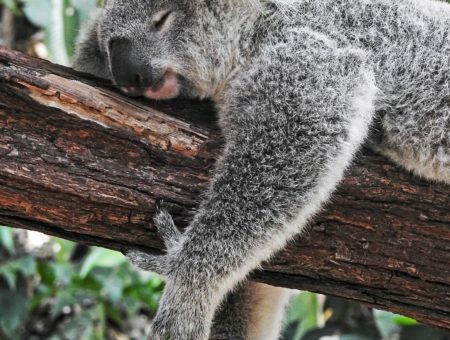 They are also associated with a certain air of mystery and independence that marks them as one of the most intriguing, stylish creatures in the animal kingdom. Even today, cats are making a statement in the world of fashion and beauty, be it on clothes, shoes, or makeup. Whether you’re a cat person at heart or not, felines have won the hearts of fashionistas everywhere. This week’s Fashion Inspired by Art features an oil painting by Franz Marc. Read on to learn more about Marc, and to see three outfits inspired by this painting of his feline friend. 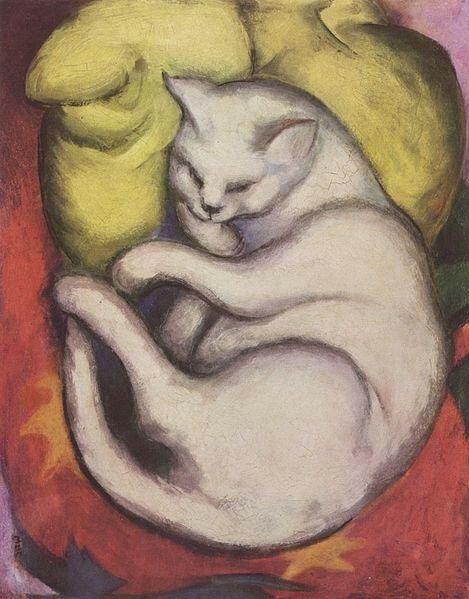 Franz Marc was born in Munich on February 8, 1880. He is noted as an important figure in the German Expressionist movement. He partook in painting and printmaking, and was also a founding member of Der Blaue Reiter (The Blue Rider), a journal associated with a circle of artists who opposed Neue Künstlervereinigung München (“Munich’s New Artist Association”). Marc began his studies at Munich’s Academy of Fine Arts in 1900, where he learned under Wilhelm von Diez and Gabriel von Hackl. He traveled to France in 1903 and 1907, where he mingled with artistic circles, and came to admire the work of Vincent van Gogh. When World War I came along, he enlisted in the German Army as a cavalryman in 1914. However, by 1916, Marc had migrated to the techniques of military camouflage, in which he painted canvas covers to hide artillery. He died in 1916 in the Battle of Verdun. He is remembered for his paintings of animals in bright colors and for his work’s strong emotional deliverance. Marc’s artwork continues to attract praise today, and his family’s house in Munich is marked with a historic plaque. You can view more of Marc’s paintings here. This first outfit gives off a fun vibe with a bit of an edge. The cat graphic adds a sweet touch to your favorite sweater, and pairing it with shorts will help course you through those chillier mornings. The bright green of the belt adds a pop of color among the darker shades in your outfit. You can also try a belt in a color that matches your boots, if you’re in the mood to coordinate your accessories and makeup. Store your things in a creamy pastel tote to soften the look, or choose a zippered black bag to toughen things up. Our next ensemble pairs a classic sweater with one of summer’s trendiest pieces: shortalls. The sweater is cropped and lightweight — a combination that’s perfect for those breezy summer days. If you’re not into the overalls trend, you could always opt for the classic dark skinny jean. The icy, glittery reds in this nail polish will look great against the cooler green shade on the bag. The colors slightly vary from the traditional red and green, so you won’t have too worry about looking too Christmas-y. Add the finishing touches to your look with a pink lip… and some cat eye eyeliner, of course. 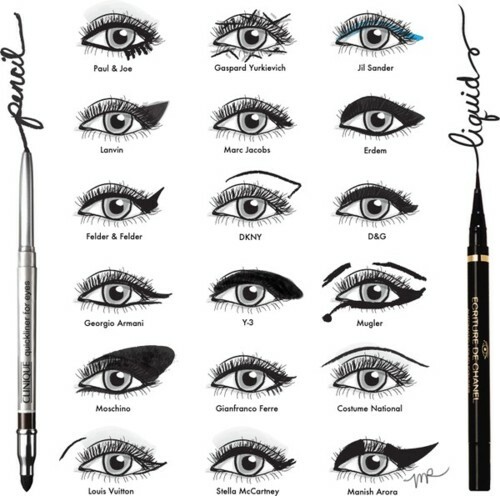 Here’s some designer-inspired winged eyeliner looks to try! Speaking of designer inspired, how adorable are these budget-friendly cat flats? They’re cute and comfortable, so you’ll be sure to always land on your feet — or at least draw a lot of attention to your statement shoes! If you’re into more structured looks, this last outfit is for you! The collared shirt paired with the colorful skirt keeps your getup polished without being too formal, and the mix of fun and sleek accessories continues to balance the outfit. Here are some high-waisted pants in a louder red if you want to brighten up your look. The cat ears on this purse offer a lighthearted interpretation of the popular quilted bag. If you really aren’t a cat person, there’s a bag with bunny ears, too. Still too cutesy for your taste? You can try a quilted satchel — it’s a nice spin on the quilted cross-body, and has more room for your things! Incorporating your feline friends into your outfit is a simple way to add character to everyday looks. Whether you’ll be playing it low-key by sporting some cat nail art or leopard print, or going all the way by wearing a dress with full-on cat print, cats add just the right amount of quirk to your ensemble. Whether or not this trend’s got nine lives, you can rely on cats to keep you fashion-forward this season. Are you a fan of Marc’s painting? 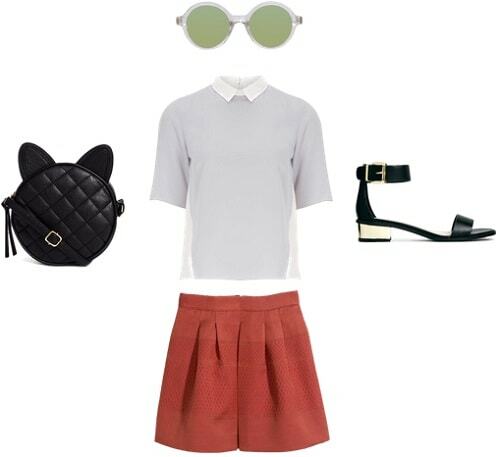 What’s your favorite way to wear the cat trend? Which of these outfits do you like the most? I’d love to hear your input in the comments section below!